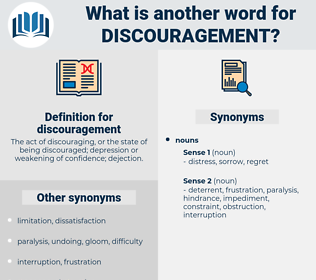 What is another word for discouragement? The act of discouraging, or the state of being discouraged; depression or weakening of confidence; dejection. 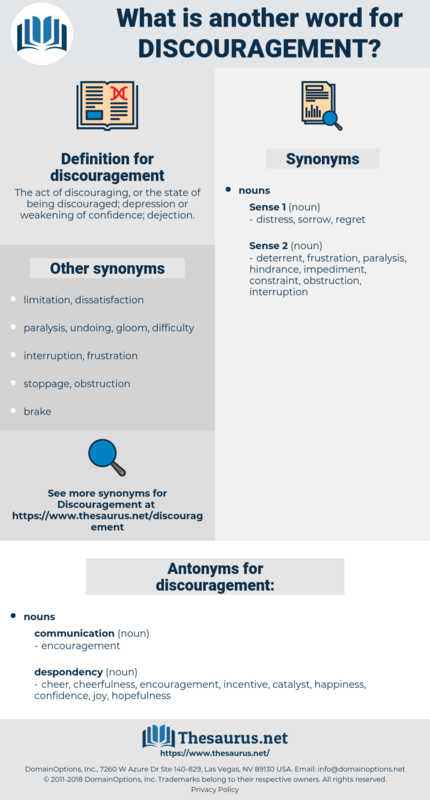 disappointment, despondency, frustration, dismay, dissuasion, disincentive. cheer, cheerfulness, joy, confidence, happiness, catalyst, incentive, hopefulness. advance, assistance, advantage, blessing, aid, help. assurance, courage, trust, elation, expectancy, anticipation, hope, expectation. That name filled the boy's soul with discouragement. Even in his discouragement Harry could not help feeling that Mr. Bachmann was strangely calm and cheerful. determent, intimidation, dissuasion, deterrence, disheartenment.